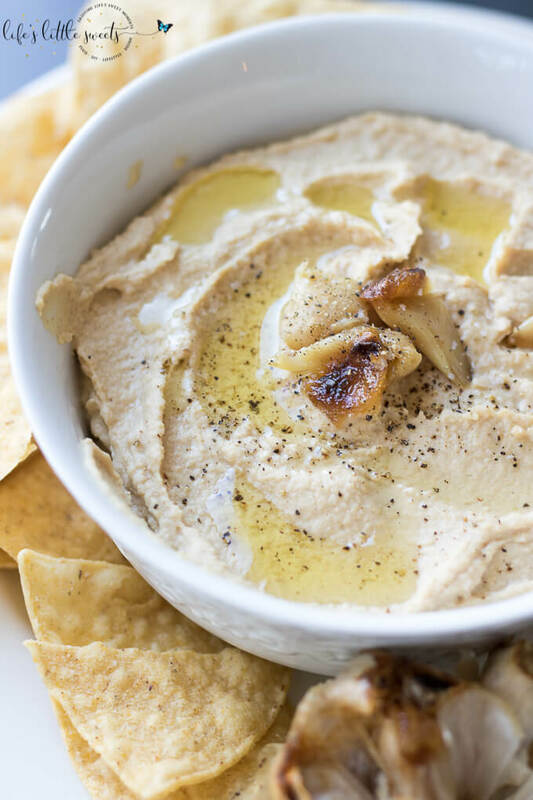 4 roasted garlic cloves or amount to taste, plus more for topping, search LLS for "How to Roast Garlic"
In a food processor, add the drained chickpeas, tahini, Kosher salt, ground black pepper, roasted garlic cloves and pulse. Add the chickpea water and process until desired consistency is reached. Add more salt, garlic or pepper to taste. Transfer to serving bowl, top with more roasted garlic, drizzle with olive oil and optionally, sprinkle with a pinch of salt and more fresh pepper. Enjoy with your favorite chips or bread. to get super smooth hummus, you can take the time to remove the chickpea membranes. The nutritional information is an estimate; we use myfitnesspal.com to generate the nutritional information for this recipe.